LTC Juanita Warman, 55, Havre de Grace, Md. MAJ Libardo Caraveo, 52, Woodbridge, Va.
CPT John P. Gaffaney, 54, San Diego, Calif.
CPT Russell Seager, 41, Racine, Wis.
SSG Justin Decrow, 32, Plymouth, Ind. SGT Amy Krueger, 29, Kiel, Wis.
SPC Jason Hunt, 22, Tillman, Okla.
SPC Frederick Greene, 29, Mountain City, Tenn.
PFC Michael Pearson, 22, Bolingbrook, Ill.
PFC Kham Xiong, 23, St. Paul, Minn. It still breaks my heart thinking of Pvt. Velez especially, who cried out for her baby as she lay dying. It’s pretty much a known fact for anyone with more than two brain cells in their head that the attack on Fort Hood was a terrorist attack. Hasan had plenty of evidence against him there. He defended suicide bombings and said that Muslim service members were justified in killing US troops. He was in contact with Anwar al-Awlaki, one of the world’s most notorious terrorists. And what did they discuss? Carrying out jihad in the United States. Yet Barack Obama continues to classify this attack as “workplace violence”. How can there be shame on someone who is shameless? If there was ever a time for the Commander-in-Chief to change the designation away from the idiotic “workplace violence” tag to something which would allow the award of Purple Hearts to the victims of Nidal Hasan’s deliberate attack on American soldiers, Veterans’ Day would be that time. I do not understand why he does not; it isn’t as though doing so could somehow inflame passions of the Muslims around the world against the United States more; we are at war against the Islamists, and are actively killing them in Afghanistan, directly, through combat, and in Pakistan via the occasional drone attack against al Qaeda leaders. We sent SEAL Team 6 into Abbottabad, Pakistan, to eliminate Osama bin Laden, and we used unmanned drones in Yemen to kill Anwar al-Awlaki and then his son,Abdulrahman al-Awlaqi, though the actual target at that time was (supposedly) Ibrahim al-Banna, an Egyptian al Qaeda operative. The Muslims know that we are at war with the Islamists, and the American people know that we are at war with the Islamists, and there is really no reason at all not to designate the Fort Hood massacre as an Islamist attack on our soldiers. THE FIRST STREET JOURNAL salutes our veterans on Veterans’ Day, and as much as I can speak for our host here, TRUTH BEFORE DISHONOR does as well. 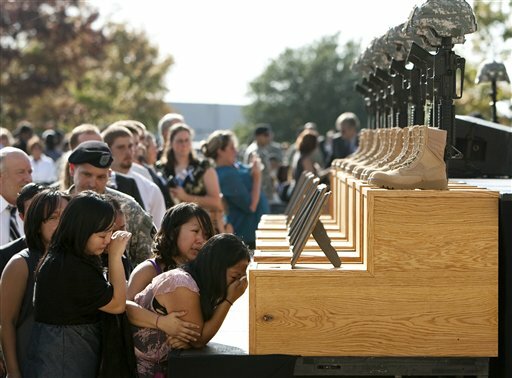 The Fort Hood Massacre victims: no Purple Hearts for them! This entry was posted on 2012/11/11 at 07:59	and is filed under Islam, military, war. Tagged: Anwar al Awlaki, Islamic Jihadist, Islamic terrorism, Nidal Hasan, terrorism. You can follow any responses to this entry through the RSS 2.0 feed. Both comments and pings are currently closed.